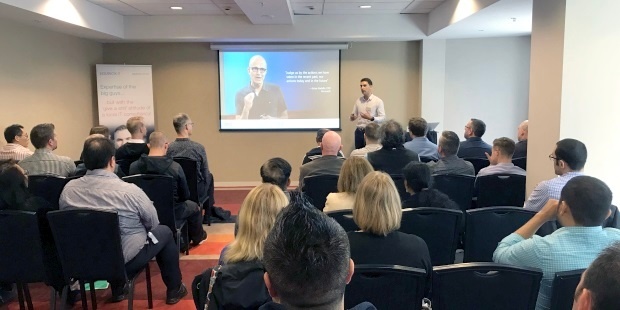 As the only New Zealand owned company to be a Microsoft Gold Partner for the DevOps competency we were delighted to yesterday work with Microsoft to deliver a half-day Azure DevOps event in Wellington. The event started with breakfast and we had a full room attending the presentations. The same event is taking place today in Auckland at Microsoft's offices. Microsoft define DevOps as "the union of people, process and products to enable continuous delivery to your end users". In this context we ran the presentations starting at the people and process level and progressed to the Azure DevOps product. 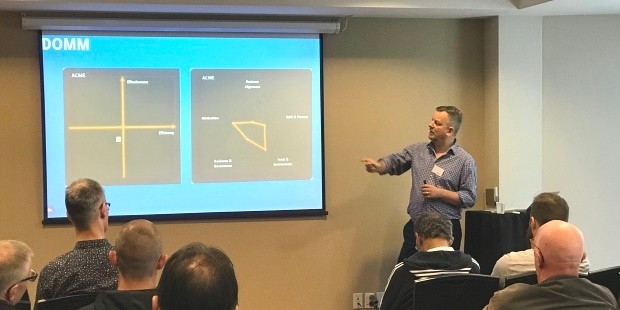 Equinox IT Principal Consultant Julien Thomas was our first speaker and introduced a framework or model to determine an organisation's maturity with DevOps and continous delivery. The model evaluates a number of criteria across people, process, tools, governance, alignment and value. The output can be used to help an organisation understand their effectiveness and efficiency using DevOps and areas of strength and weakness for continued improvement. 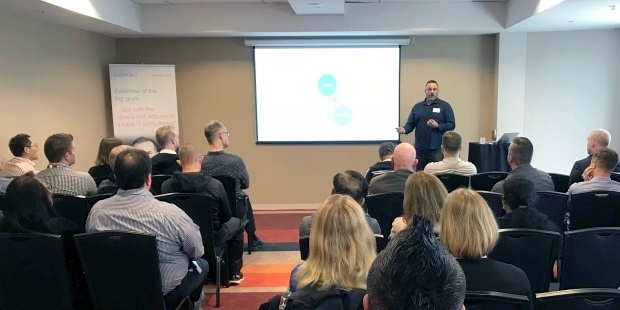 Equinox IT General Manager for Cloud and Auckland David Reiss then presented an case study of a client we have taken from waterfall development to DevOps, including helping them adopt Microsoft Azure. 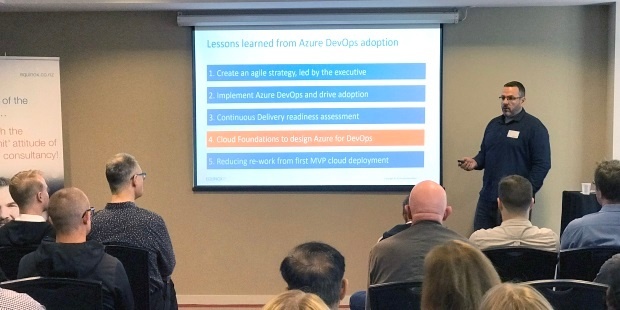 David noted that 80% of our consulting work related to people and process, helping the organisation to change, adopt new approaches and gain the required skills; 20% related to implementing the Azure DevOps tool. 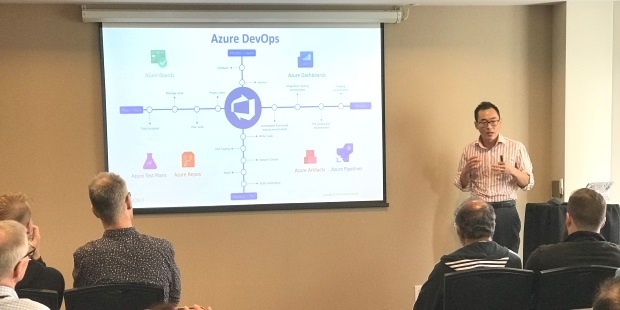 Equinox IT Development Specialist and Microsoft Virtual Technology Solutions Professional (vTSP) Ashley Stewart delivered a product overview of Microsoft Azure DevOps (previously Visual Studio Team Services). Azure DevOps continues Microsoft's substantial contribution to the open source community - they are the largest contributor by a factor of two over Google. Azure DevOps can be used together with open source tools, and services can be turned on or off as required depending on what other tools your organisation may already use. Ashley stepped through the services available in Azure DevOps, including Azure Boards, Azure Repos, Azure Pipelines, Azure Test Plans and Azure Artifacts. Equinox IT Cloud Solution Architect William Wang ran the last presentation after morning tea, and demonstrated Azure DevOps in action, particularly focusing on how to run a continuous delivery pipeline. William outlined some of the common problems he has come across in software development, including ad-hoc code reviews, manual builds, security and performance testing, inconsistent environments, and deployment issues - all of which ultimately lead to less regular deployments and subsequently the potential inability to meet business need. Using infrastructure as code William showed an app he had built and deployed to different environments in his pipeline and demonstrated how easily he could make changes to the app and deploy it again through to those environments, including automated tests to ensure that the app was functioning and performing as expected in each environment. Thank you to Microsoft for hosting and administering both events and to Joe Newton of Microsoft who introduced both events. In addition to our DevOps Gold Partnership, we are also a Microsoft Gold Partner for the Cloud Platform competency and a Microsoft Silver Partner for the Cloud Productivity and Application Development competencies. Please contact us if you want to find out more about this event or if you would like to be added to our invite lists for future events we run together with Microsoft.